Was at the British Library at the weekend and although it ended up being a real dash through, I (we) were rather taken by their new show Evolving English. It threw up a lot of things with reference to my Studies in Indirect Communication projects. I'm going to try and put a few of the books up here that are particularly interesting for me over the coming weeks. First up are two books relating to multiple voices, dialogues, exchange between voices. Sumer is icumen in (Spring has come in - there was no difference between summer and spring back then apparently. Sounds about right for Britain) is a Middle English song written for up to six voices. 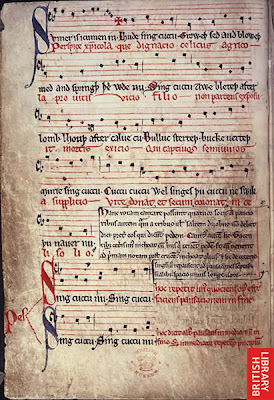 It's the oldest known rota or round in English - each voice sings the same song, to the same melody, but beginning at a different point in the song. 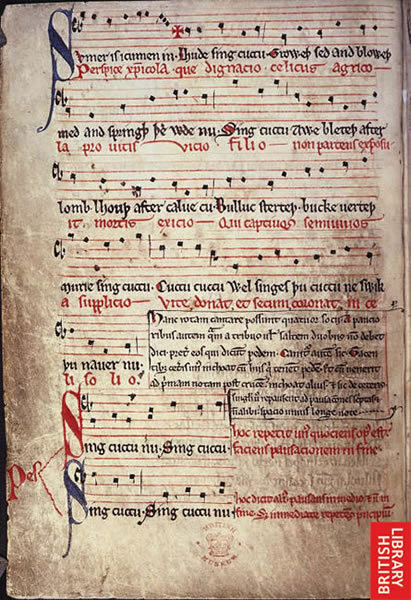 The cross above the first line marks the point at which each of the four main voices enters. 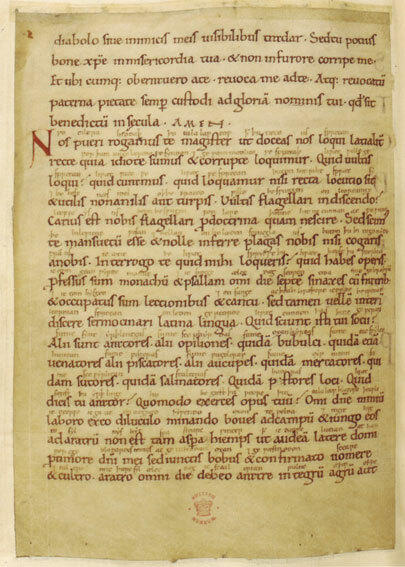 The red ink below the black English lettering is a Latin text on Christ's Passion. 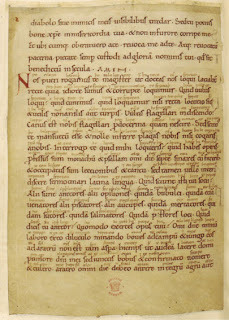 The text inset to the right of the pages gives instructions in Latin for its performance as a round. The parts for the lower voices are written on the bottom two lines. Pupil: We children ask you, O teacher, that you teach us to speak [Latin correctly], because we are unlearned and we speak corruptly. Teacher: What do you wish to talk about? Pupil: What do we care what we talk about, as long as the speech is correct and useful, not idle or base. Teacher: Are you willing to be beaten while learning? Pupil: We would rather be beaten for the sake of learning than not to know it. But we know that you are kind, and do not want to inflict a beating on us unless we force you to it.